quick puncture repair kit for passenger cars * re-mobilize your car within 2 minutes * for car tyres with pressure up to 45 psi There is no simpler, faster and more effective way to repair a tyre puncture - and to continue your journey after only 2 minutes. There is no simpler, faster and more effective way to repair a tyre puncture - and to continue your journey after only 2 minutes. The aerosol can is directly connected to the sealant bottle. When pushing the button, the sealant is pumped into the tyre and the required minimum air pressure is established so that you can continue to drive. The tyre pressure is further increased by the warming of the tyre while driving. 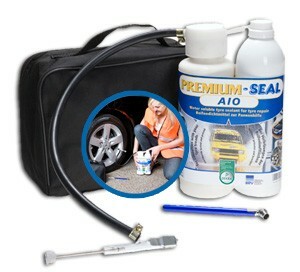 The tyre sealant is newly developed and it prevents chemical reactions when used with aerosols. The construction of the aerosol can offers more safety margin than what is required by the law. 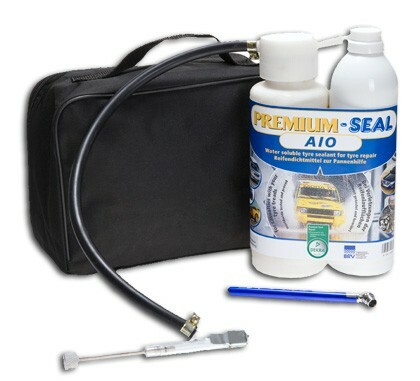 700 ml PREMIUM-SEAL Repair tyre sealant is suficcient for any common passenger car tyre. Water soluble. Sealant can easily be removed from rims and tyres. Technically a punctured tyre can be repaired. The guidelines for the repair of air tyres are applicable.